Faith Rodgers during a news conference in New York today. 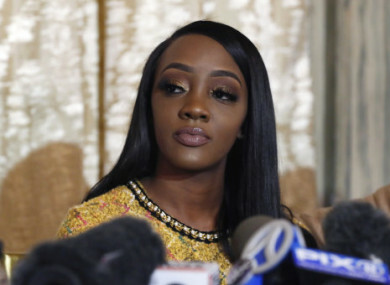 A WOMAN WHO sued R. Kelly accusing the American R&B star of sexual battery, knowingly infecting her with a sexually transmitted disease and false imprisonment says he has threatened her. High-profile women’s rights attorney Gloria Allred told reporters today her client Faith Rodgers, 20, faced “efforts to intimidate and retaliate” from Kelly after she filed the lawsuit now pending in New York’s Supreme Court. And just after Rodgers testified in the Surviving R. Kelly documentary that aired earlier this month, her lawyers say Kelly, 51, and his team created a Facebook page — which the social media giant removed within hours — in an effort to discredit his accusers including Rodgers, posting “private” photos of her. Rodgers filed the lawsuit in May, slightly over a year after she says she met the singer — known for hits including I Believe I Can Fly and Ignition — following a concert in San Antonio, Texas. “Taking a stand against R. Kelly, someone who has been termed ‘the King of R&B’ and is loved by many has not been easy,” Rodgers said. You can look forward to a legacy which will not be your music, but rather the pain and suffering you inflicted on the many vulnerable teenagers and young women who claim they were victimised by you. Email “Woman suing R. Kelly for sexual battery accuses his team of threatening her with 'private photos' ”. Feedback on “Woman suing R. Kelly for sexual battery accuses his team of threatening her with 'private photos' ”.